To say that we like cheese is an understatement, to say we love butter doesn’t even begin to explore the depths of our adoration. Butter is actually very similar to cheese, it has many of the same steps and as many nuances and is almost as regulated. How often, say at a restaurant when they present you with bread and butter or at a supermarket when faced with a wall of sticks and tubs, do you stop and actually think about how that butter was made and where. Oh sure, you might have a bit of brand loyalty or splurge a bit on fancy butter for visitors or holidays; but the majority of people don’t think about what it is that they’re plucking off the shelf and then shoving in their fridge where it’ll live in dubious conditions for who knows how long. Not that we’re judging, until we started eating “the good stuff” we did exactly the same thing, one brand was a good as the next and the only time we read the box was when we were double checking that we’d picked up salted. The good stuff; cultured butter which may or may not be imported. But what does that mean, cultured? Well, its like it sounds, its milk that has been cultured by adding living (friendly and good for you) bacteria much like you would to make yogurt or cheese. You’re starting the fermentation process, like if you were making beer, pickles, or bread The bacteria munches on the lactic sugars in the fluid milk and changes them to lactic acid and the longer you let the bacteria munch (6-12 hours is the usual range, traditionally overnight) the more nuanced and flavorful your end product will be. It’s a delicate balance though, too much lactic acid and it’ll spoil and be gross instead of delicious. There’s also a matter of what the animal has been eating, and for that matter what kind of animal you’re getting the milk from to begin with. Like cheese you can make butter from the milk of almost any ruminant; cow, goat, sheep, buffalo, and yak. When the animal is on pasture or being fed green feed (cut grass, silage or alfalfa ) the butter will be a bright yellow due to the beta-carotene and it’ll also have a more nuanced flavor then when its being fed hay or grains. We’ve been making butter some estimates say for 10,000 years, molecular traces have been found in pottery dating back that far. I’m not going to give a 10,000 year history lesson, we’ll only go back a couple of centuries, pre-industrial revolution and to a farm that could be any where in the world. Generally you milk a cow in the mornings and evenings, the morning milk usually was used to make your cheese and the evening milk was traditionally stored in a pail or bucket in a cool room over night. Over night the cream would separate from the rest of the milk and rise to the surface, also during this time natural cultures would start to do their thing as well, and in the morning the farmer’s wife (traditionally it’s the wife as the husband is out tending stock and fields) would skim the cream off. The cream would be put into a churn (and there were many different designs) and the cream would be churned or beaten, if you’ve got a kid too young to go to the fields but to old for the nursery, they were often set to churning butter. Churning further separates the fat from the rest of the milk (proteins and whey and vitamins etc) and eventually form numerous chunks. Those blocks would be gathered and then get kneaded (like bread) or spun in a centrifuge to expel even more moisture; this would be the buttermilk. 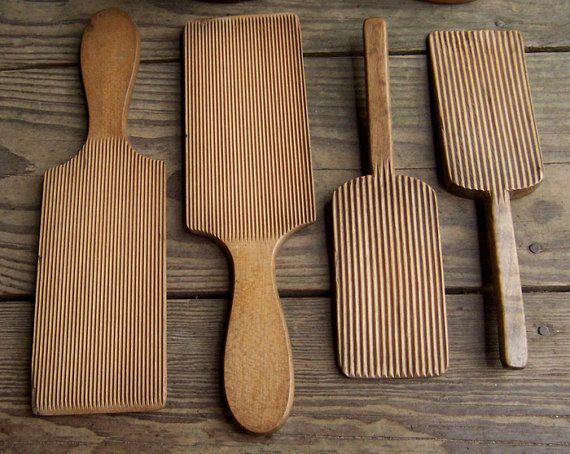 The remaining mass is then either salted or left unsalted before it is then cut and formed into shapes, traditionally by using wooden butter paddles so hands don’t melt the butter, where it then wrapped in ether foil or wax paper for sale. We currently stock three butters year round, and at the moment have a seasonal butter; Rudolphe le Meunier’s Beurre de Barette (from Normandy, France), Les Pres Sales Camargue Butter (from Belgium), and two from Ploughgate Creamery (from Fayston, Vermont), the classic Cultured Butter and their seasonal Ramp Butter. Rudolphe le Meunier is a bit of a rock star in the cheese and butter world, he’s one of the best cheese-mongers in the world and an affineur extraordinaire. 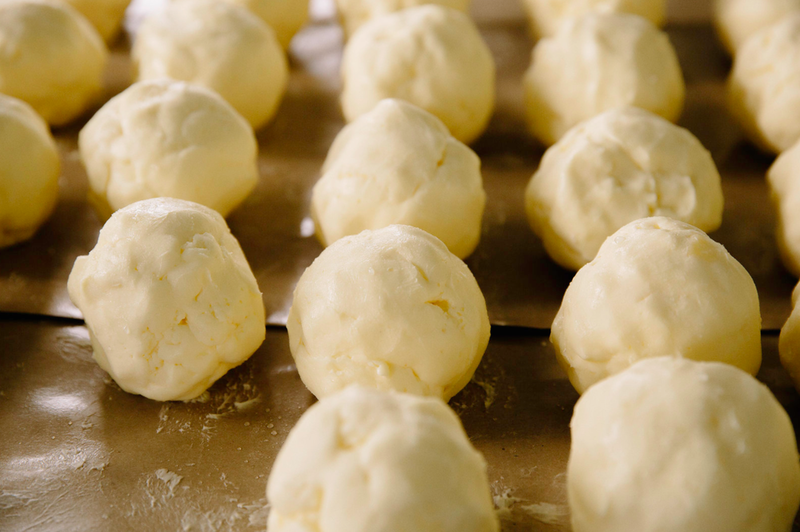 He has his Beurre de Barette made to his recipe in Normandy and sends it all over the world. It is sublime; rich and, well, buttery, with a hint of nuts and tang and a beautiful balance of sea salt on the end. We literally eat this butter on toast every morning, and have been know to bring it on vacation because we can’t imagine going without. 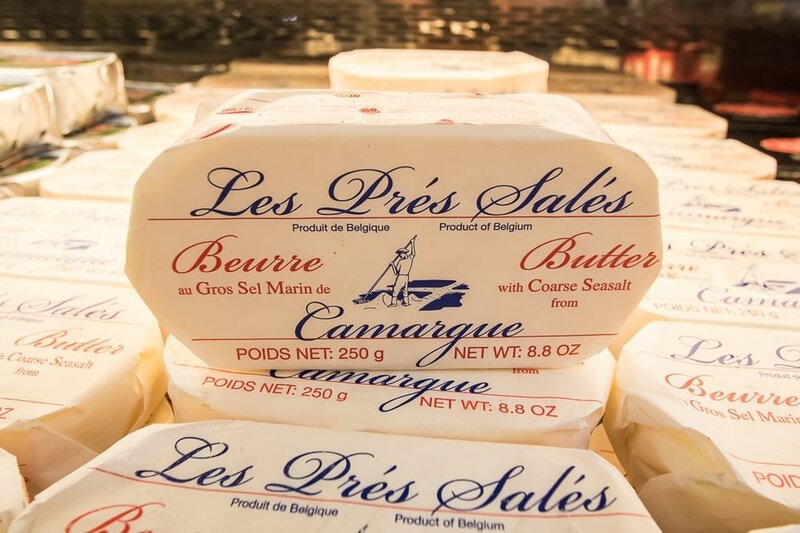 The Les Pres Sales Camargue butter is made in Belgium from cows that graze on the Ardennes plateau and has flakey gray sea salt from the Camargue salt beds in the Rhone delta. Salty and big with a hint of grassiness and minerals it has a satisfying salt crunch when spread on a baguette or put on fresh corn or a baked potato. 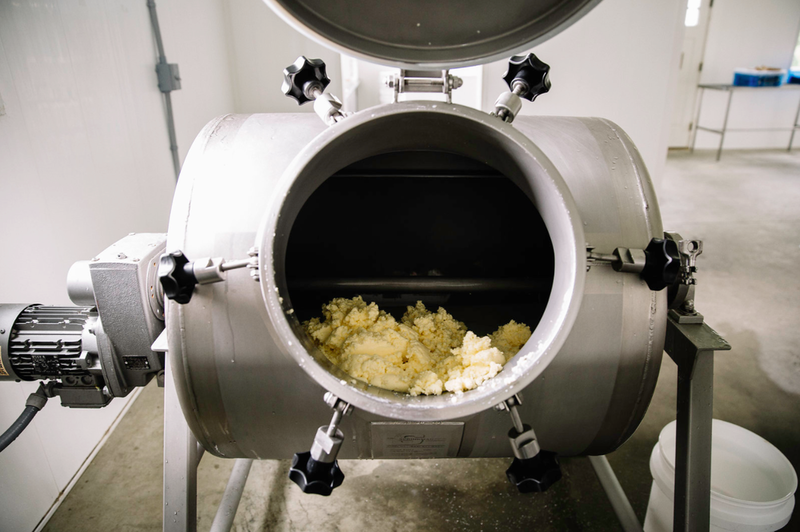 Ploughgate Creamery is owned and run by Marisa Mauro who, with the help of the Vermont Land Trust, bought the century old Bragg Farm and started making cultured butter in 2013. 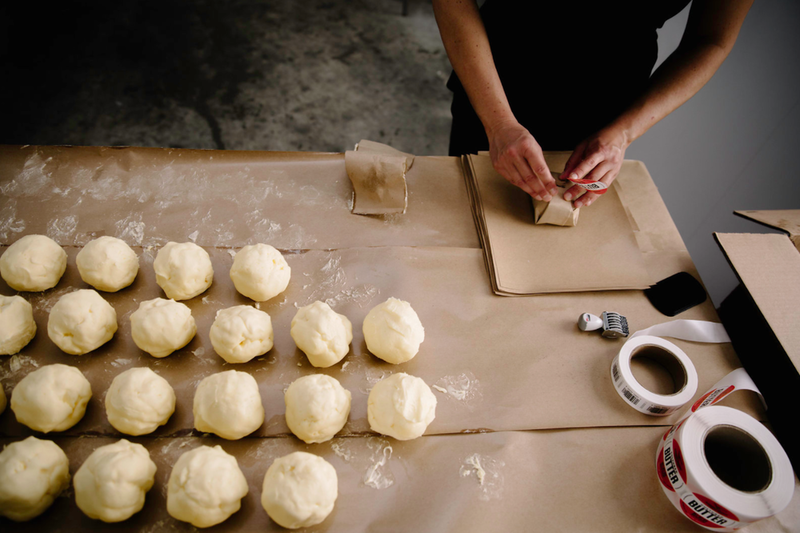 Made with milk from a neighboring farm, the milk is cultured for 48 hours before heading to the churn, it's salted with sea salt and formed into half pound blocks before wrapping. Ploughgate butter is grassy and rich with less of a salty punch then either the Meunier or the Camargue, and a pleasing yogurty tang on the end. We were lucky again this year in getting some of the very limited release of Marisa’s ramp butter, made using fresh foraged Vermont ramps. Use the ramp butter on pretty much anything; mussels, steak, potatoes, in eggs, or anything else you can imagine. 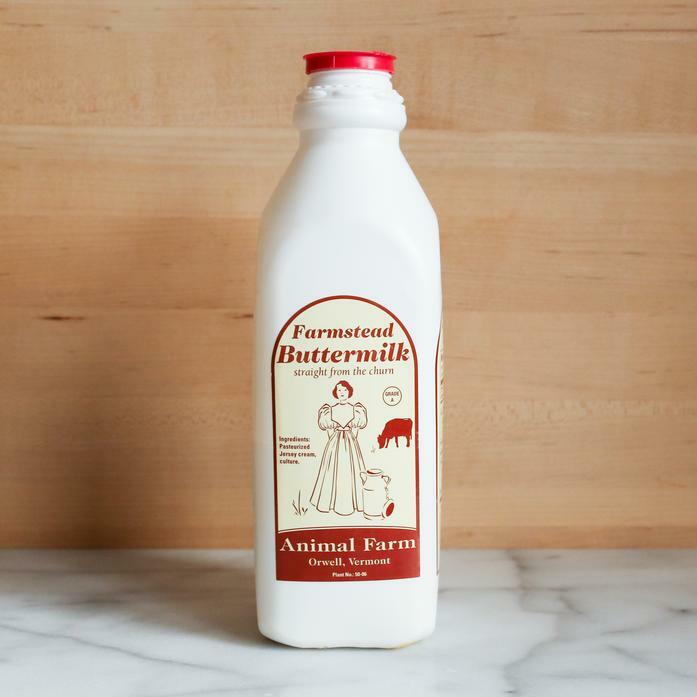 And if you’re looking for good buttermilk, there is no better than the buttermilk from Animal Farm in Orwell, Vermont. Sadly we can’t get their infamous butter (it all goes to Thomas Keller and Barbara Lynch and Patrick O’Connell’s restaurants) but we can get the by product. Rich and tangy it makes the best waffles, scones, soda bread, or just a refreshing drink.